Contemporary composer and musician Christopher A. Williams’ tastes run towards the experimental. He enjoys improvising with a range of different styles and media whether he is presenting chamber music at concerts in Europe and North America or developing multimedia performances for radio stations and museums. Contrabassist, composer and curator Christopher A. Williams is at home in many worlds - both physically and artistically. Born in San Diego California in 1981, he spent several years in Barcelona before settling down in Berlin in 2009. Williams still spends a lot of time on the road though, playing and performing throughout Europe and North America for audiences from Norway and Latvia to Spain and the USA. As a musician, Christopher A. Williams loves improvisation and has worked with various renowned (improvisational) artists, such as British guitarist Derek Bailey, US drummer Justin Bennett and the French sound art ensemble Compagnie Ouïe/Dire. As a composer, he creates contemporary, experimental music in a wide range of formats and media ranging from improvisational chamber music to radio art and multimedia pieces. Together with visual artist Tanja Smit, Williams composed The English Dancing Master Leads: or, Mr. Bailey’s Maggot, amultimedia piece exhibited at the Barcelona Museum of Contemporary Art (MACBA), and has developed radio pieces for Deutschlandradio Kultur and other broadcasters. Christopher A. Williams' inclination for the experimental extends to his notation and he writes outside the classical stave lines. He is much more interested in how musicians interpret and interact with alternative Christopher A. Williams in November 2018 at a rehearsal with Ensemble Supermusique in Montreal | © Supermusique notations, including illustrations or drawings, or the Borromean Rings, which he interpreted musically with tubist Robin Hayward. He is also exploring notation and improvisation for his doctoral thesis at Leiden University in the Netherlands. 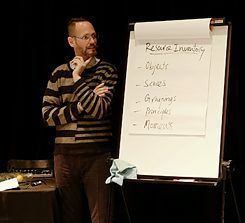 Williams has lectured at universities in North America, Europe and India on the interaction of thought, perception and action in experimental music. Berlin is teeming with artists, ensembles and musical initiatives, and the capital has become a cultural centre for new music. Christopher A. Williams is an instrumental part of the city’s music scene. Together with musicologists Marta Blazanovic-Drefers and Andreas Engström, he curates KONTRAKLANG, a monthly concert series for contemporary music that brings together different styles and forms - from chamber music and sound art and composer-performer practices to media-based art and musical theatre. With musician Chris Heenan, he also curates Certain Sundays, an experimental music salon where artists perform their work and interact with the audience over coffee and cake.